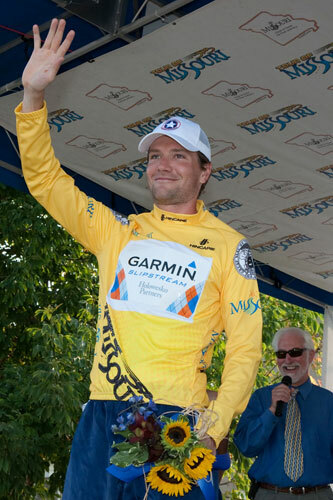 David Zabriskie gave his Garmin-Slipstream squad a second reason to celebrate today by winning the stage five time trial in the 2009 Tour of Missouri. The champagne corks had barely hit the floor at Garmin HQ after Ryder Hesjedal’s stage win earlier in the day at the Vuelta a Espana, when USPro champion Zabriskie scorched the competition in Missouri’s stage against the clock and grabbed the yellow leader’s jersey. After a frustrating year littered with second places, Garmin have come good at the end of the season. As well as Zabriskie and Hesjedal’s wins, Tyler Farrar also won Wednesday’s stage of the Vuelta. Back to Missouri… having been all about the sprinters so far in the Tour of Missouri, Friday’s time trial gave the overall contenders a chance to flex some muscle. The course around the Missouri state fariground presented a largely flat but winding route, and probably not the most picturesque surroundings that the riders have encountered. Several riders elected not to use time trial specific bikes, including race leader at the start of the day Juan Jose Haedo (Saxo Bank), who used his regular road bike with clip-on aero bars and a disc wheel. Haedo was under no illusion that he would hang on to the lead after today’s stage, so limited his losses and conserved some energy for Saturday. The 2009 Tour of Missouri concludes on Sunday, September 13.